On May 10, 1912, Glen L. Martin flew his hydroplane, built in Orange County, from the sea near the Balboa Pier to Catalina Island. This was the fastest and longest flight over water at that time. 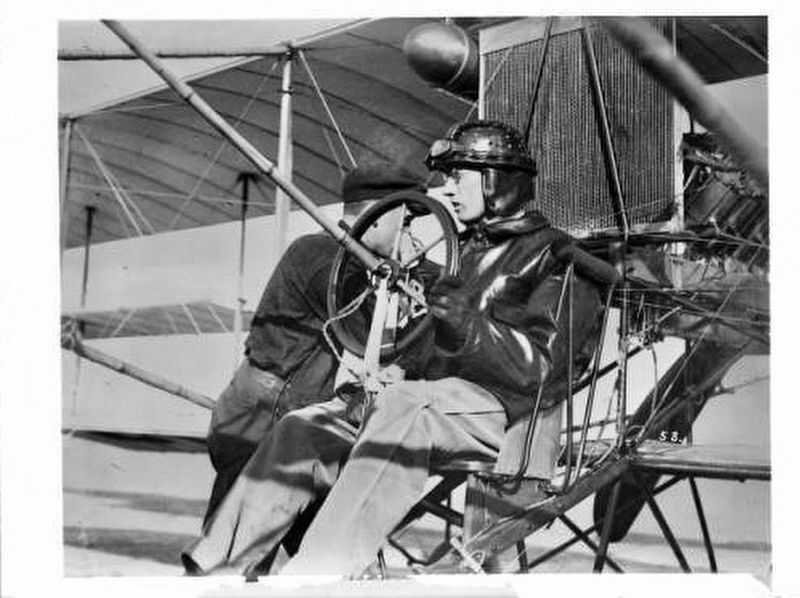 Glen L. Martin flew his own plane, built in Santa Ana, from the waters of the Pacific Ocean at Balboa to Catalina Island, May 10, 1912. 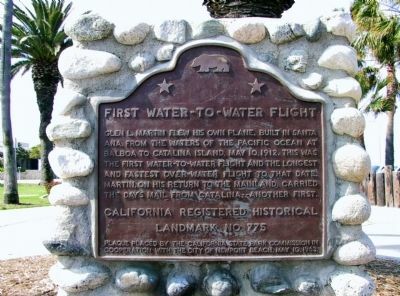 This was the first water-to-water flight and the longest and fastest over-water flight to that date. Martin, on his return to the mainland, carried the day's mail from Catalina--another first. Location. 33° 36.055′ N, 117° 53.991′ W. Marker is in Newport Beach, California, in Orange County. Marker is on Balboa Pier. Touch for map. Marker is at or near this postal address: 1 Balboa Pier, Newport Beach CA 92661, United States of America. Touch for directions. This new marker has replaced the old one. (about 600 feet away); Balboa Pavilion (about 700 feet away); First Ferry Service Between Balboa and Balboa Island (approx. 0.3 miles away); Old Landing (approx. 1.2 miles away); McFadden (Newport) Wharf (approx. 1.7 miles away); Site of 3rd National Boy Scout Jamboree (approx. 1.9 miles away); Mariner's Mile (approx. 1.9 miles away). Touch for a list and map of all markers in Newport Beach. More about this marker. This site has been designated as California Registered Historical Landmark No. 775. 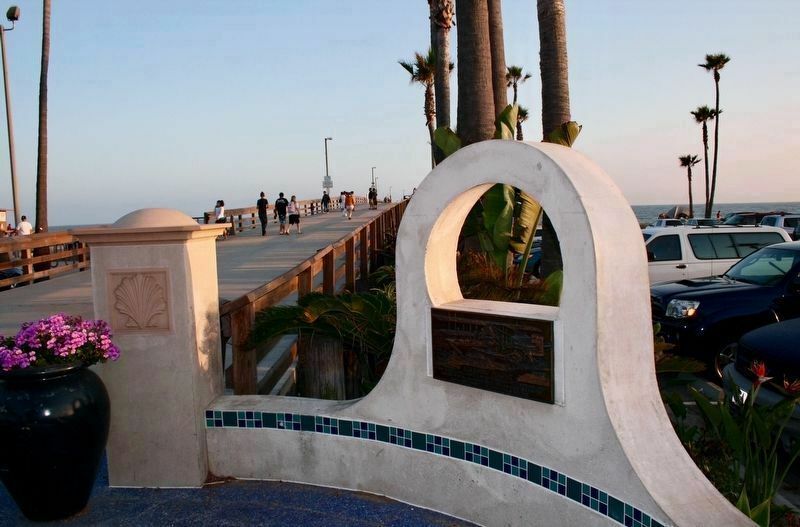 During a remodel of the Balboa Pier, some time around 2010, the original marker was removed and replaced with a smaller marker. More. Search the internet for First Water-to-Water Flight. Credits. This page was last revised on June 26, 2018. This page originally submitted on December 10, 2011, by Michael Kindig of Long Beach, California. This page has been viewed 589 times since then and 13 times this year. Last updated on June 26, 2018, by Craig Baker of Sylmar, California. Photos: 1, 2. submitted on June 26, 2018, by Craig Baker of Sylmar, California. 3. submitted on December 10, 2011, by Michael Kindig of Long Beach, California. 4. submitted on June 26, 2018. • Andrew Ruppenstein was the editor who published this page.